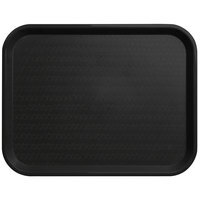 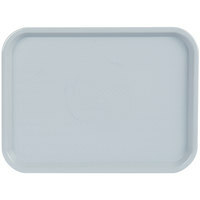 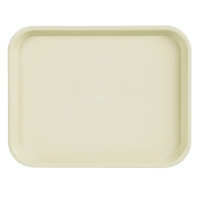 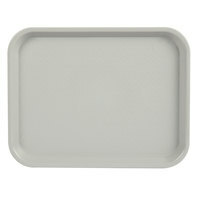 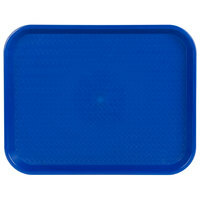 These cafeteria trays are constructed to make the user's dining experience more enjoyable. Many are made with skid-resistant surfaces to help keep plates, utensils, and more in place while they’re walking from the serving line to their seat. You'll also find lunch trays with built-in cup holders to keep cups, bottled water, and more from falling off the tray and spilling. 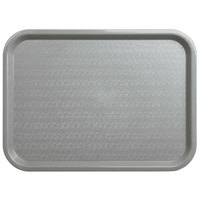 Also make sure to check out other great items from Choice, Cambro, Carlisle, Dinex, GET Enterprises and Vollrath. Carrying multiple plates and drinks from the checkout counter to the table can be difficult, but using fast food trays makes it easy. 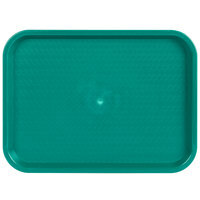 These products are ideal options for cafeterias, buffets, and fast food establishments where customers may choose multiple dishes. Additionally, if your plates and dishes are hot, these cafeteria trays provide a buffer that prevents your customers from burning their hands. 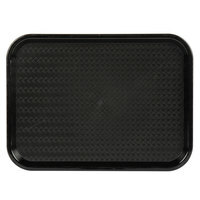 Many of our fast food trays are also dishwasher safe, so they're easy to maintain. We also offer trays in a wide variety of material types, shapes, and colors, making it easy to find products that match your existing decor. To learn more about the differences between these products, explore the tabs above and the filters on the left side of the page. 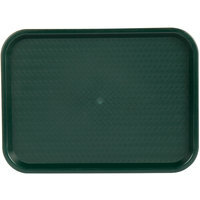 These durable trays have a double thick fiberglass core. Fiberglass trays feature plastic reinforced with glass fiber. Cost-effective plastic trays are perfect for food transportation. Use these heat-resistant trays for high-volume applications. Patterned cafeteria trays add visual appeal to your table and provide contrast that makes your food look more appetizing. Our faux wood fast food trays have the look of wood, but they are more durable and easier to maintain, making them ideal for commercial use. Solid color fast food and cafeteria trays allow you to create a complementary color scheme in your restaurant or match your existing decor. 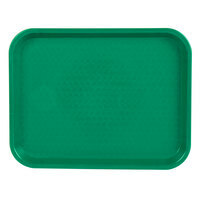 Ensure that your drinks stay secure during transportation by using cafeteria trays with cup holders in your institution or hospital. 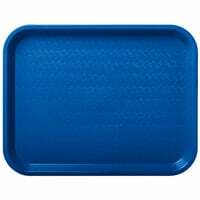 Our customizable fast food trays allow food courts, universities, and fast food franchises to personalize their trays by adding a logo. 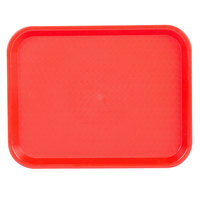 Dishwasher safe fast food trays are a convenient option because you can simply put them in the dishwasher rather than cleaning them by hand. 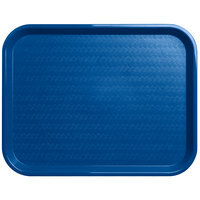 Cafeteria trays with handles make it easy to carry heavy loads of food and provide added stability when delivering trays to guests. 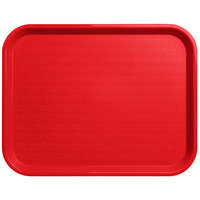 Choose fast food trays Made in America for your foodservice operation to help support domestic businesses and fuel the local economy. NSF Listed cafeteria trays are certified by an independent organization, so you know that all of these products are safe to use. 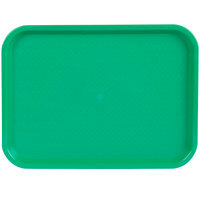 Whether you’re looking for traditional rectangular trays, or you’re searching for trapezoid styles that help save tabletop space at round tables, you’re sure to find cafeteria trays best suited for your serving operation. You’ll also find stylish bistro trays for use in cafes and other outdoor seating areas. By providing guests in your foodservice establishment with any of our fast food trays, they’ll be able to collect and transport meals much more easily. 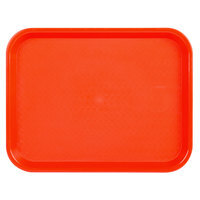 To find more great dinnerware for use in your casual dining establishment, check out our selections of restaurant flatware, melamine plates, and plastic tumblers. 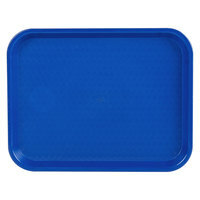 If you're wondering where to buy fast food trays and cafeteria trays, we have a large selection of fast food trays and cafeteria trays for sale at the lowest prices.